I love recipe club day. I love learning new recipes. I love trying new recipes. But unfortunately, I have been in a recipe "rut". I would call it the winter blues but the temps in GA have been fantastic. It feels like spring, so to be honest I'm not sure what my problem is with cooking new meals lately! So I thought it would be fun to share our "recipe" for a fun family Valentine dinner!! 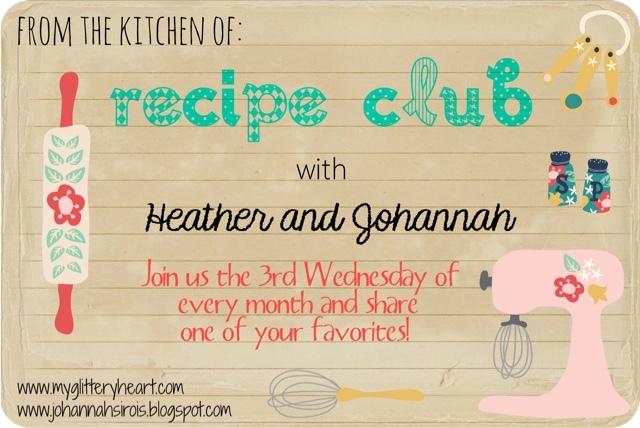 Join Johannah and myself and share your FAVORITE recipe! I can't wait to try one!! Grab our graphic and link up below!! This is how we did Valentine's last night! We got out the fancy plates! I wrapped them each their favorite candy! We had to use the emoji napkins! What's Valentines without a candle lit dinner?? I made homemade lasagna. I shared this recipe a few months ago! It's amazing if I do say so myself! I have mentioned before that Ben's grandmother hand painted our china. If you pray, please keep her in your prayers. She is not doing well. Thank you! We also had yummy caesar salad. Before we dug into our yummy dinner, the kids opened their gifts! Their favorite candy! Gummi Bears and Gummi Worms! Just a little something to say I love you! We enjoyed our time together and enjoying a yummy meal! I think our "recipe" for a family fun Valentine dinner turned out perfect!! I can't wait to see what recipe you share today! Make sure to link up below!! Did you have a yummy Valentine dinner at home or did you go to a fancy restaurant??? Can't wait to hear all the details! !